Kris' other 'moms' threw her a wonderful shower in VA. It was a great time and we got some really nice gifts that we're excited to use with the new baby. We had our Child/Infant CPR class, which was what you'd expect...nothing to exciting, but we now feel prepared in the very unlikely event we'll need to use the skill. Kris' good friend Colleen threw her a surprise shower with all of her local friends, which was the first of her showers to be a surprise. Rumor has it, she was very surprised. She loved seeing everyone and eating her favorite ice cream cake. 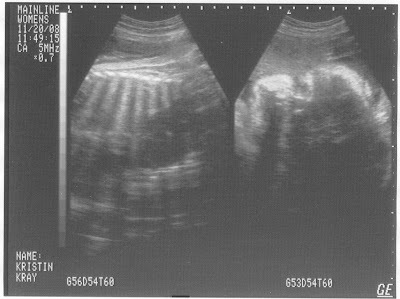 We had another ultrasound (see above) to see how the baby is progressing. It's already at 7.2lbs, which is big but still in an OK range, per the doctor. Dad thinks it's good because it will be more durable upon entry to the world. Mom likes it because it justifies some of her size. The pic above totally looks just like Dad.....this is one lucky kid. The baby's coming whether you're ready or not so at least pretend that you're ready so the baby will not panic! I think I am beginning to panic. I mean, what if this kid ends up actually liking the Red Sox?